PropertyGuys.com is reconstructing how real estate is bought and sold. We’re NOT real estate agents or brokers. We’re something very different – something much better. We are a franchise network of people on the ground in communities all across the country that provides a safe and practical way for buyers and sellers to connect and avoid the high cost of commission. PropertyGuys.com is Canada’s only full-service, private sale franchisor. Our ever expanding circle of franchises now includes over 600 communities from coast to coast. Armed with a business plan and a dream, Ken LeBlanc and Jeremy Demont opened their first PropertyGuys.com location in Moncton, New Brunswick with funding and mentorship from Futurpreneur Canada. 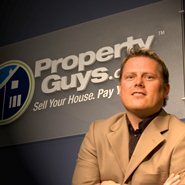 Beginning humbly with only two employees in early 1998, PropertyGuys.com is now Canada’s only full-service, private sale franchisor. Their ever-expanding circle of franchises now includes over 100 franchises and 600 Canadian communities from coast to coast. Ernst & Young Entrepreneur Of The Year Award – Atlantic Finalist in 2006, PropertyGuys.com is a forward-thinking organization. It has opened a state-of-the-art training facility, PropertyGuys.com University (PGU) to educate new recruits in the art of private selling, owning a franchise system and industry best practices. Ken LeBlanc is the youngest member ever inducted into the Atlantic Canada‘s Top 50 CEOs Hall of Fame by Atlantic Business Magazine. The PropertyGuys.com's company recognition is continuing to soar and recently been honoured by the Canadian Franchise Association with the National Award of Excellence. Futurpreneur Canada was there with financing when others refused us. It opened the doors to future financing – something we desperately needed during the growth stages of our business.